(CNN) -- Movie ticket sales are way up in this down economy. "Paul Blart: Mall Cop," starring Kevin James, is the No. 1 movie of the year so far. Observers say struggling people are looking for a $10, two-hour escape. "The movies offer a way to go not only outside of your house, but to a whole different world -- and that's very appealing right now," said Paul Dergarabedian, a box office analyst at Hollywood.com. Audiences are going along for that ride in record numbers. Gross movie ticket sales to this weekend were up 18.8 percent over the same period last year, to $1.66 billion, according to BoxOfficeMojo.com. Box offices saw their best January in history this year, with more than $1 billion in gross sales. Jeremy Kay, a blogger for the UK newspaper The Guardian, used that news to predict that this will be the biggest year for ticket earnings in the history of Hollywood. "If you look at what's coming up over the next 10 months it seems reasonable to assume this year will be the biggest we've seen," he wrote on the site's film blog. Analysts say the recession also is likely to affect the types of movies being made by Hollywood, how they're made and what will succeed. Based on recent successes, there's evidence to suggest studios will continue to focus on comedies and action films. Of the top five top-grossing movies of 2009, three -- "Mall Cop," "He's Just Not That into You" and "Bride Wars" -- are comedies. One, "Hotel for Dogs," is a family movie, and "Taken," so far the No. 2 film in terms of sales, is an action film about a kidnapping. And films such as "Mall Cop" are winning big with viewers despite some scorn from critics. 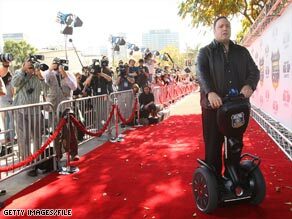 The film, which stars Kevin James as a crime-fighting, Segway-riding security guard, is so far the No. 1 grossing film of the year, with an estimated $121.4 million in sales since it opened in mid-January. But films like "Mall Cop" could succeed in any financial climate, said Jeanine Basinger, a film historian and chairwoman of the film studies department at Wesleyan University in Connecticut. People always have turned to movies during hard times, Basinger said, but it's oversimplifying to say light or funny narratives will succeed in a recession and serious subject matter won't. "Films are a good form of entertainment during a recession because you can sit back and -- sad or happy -- you lose where you are and you go into the movie," she said. It's also difficult to say whether certain types of films will be made because of the recession, she said. It can take years for a movie to make it from studio approval to theaters -- and in that time, a lot can change. There's no better recent example of this than "Confessions of a Shopaholic," Dergarabedian said. The movie was based on a successful series of books, the first of which came out in 2000, at the height of the dot-com boom. But the film -- with a trailer that shows a spendthrift young woman piling up credit card debt until her card is declined at a high-end boutique -- opened with a disappointing $15.07 million on Presidents Day weekend. The film didn't work because it hit too close to home with viewers, Dergarabedian said. He says only movies that turn away from financial realities will succeed during the recession. His case in point: "Friday the 13th," a slasher remake, earned a gross $40.57 million the same weekend "Confessions of a Shopaholic" debuted, according to BoxOfficeMojo.com. "If Jason is scaring the crap out of you, you can't really be thinking about your mortgage, you know?" Dergarabedian said. Basinger disagrees. During the Great Depression and World War II, films were true to current events and succeeded with viewers, she said. People sought escapist fare during those times, she said, but they also "went to serious downer movies about the situation they were in, too, because they were trying to understand them." Other analysts look further back into history for evidence that hard times could stir up creativity in the film industry. In the same way the Great Depression sparked creativity and influenced the Golden Age of film, today's filmmakers may use hard times for inspiration, said Erin Trahan, managing editor at The Independent magazine, which covers the indie film industry. "There may be a burst of quality of products, in a way," she said. "Anytime there's financial stress, people become more creative." The cost of making films is down, she said, which may lead to some ambitious projects. But, she added, people who already have made films may have a hard time getting them distributed. But Gerald Peary, a documentary filmmaker and critic in Boston, Massachusetts, said the recession means fewer movies will be made. "It's a romantic myth that having no money is good for movie making," he said. Peary said the recession will kick off an era of stupid movies -- since those are the ones that are sure to succeed with downtrodden audiences on smaller budgets. "The dumber the movie is, sometimes, the more money it makes," he said. "Those movies are somehow both critic proof and depression proof." Basinger, the film historian, said it's too soon to identify any firm trends involving movies and the recession besides the fact that more people will go to see them. Where they'll see them is up for debate. The venue may be the theater, it may be on a cell phone, she said. The recession, she added, is likely to speed up changes in the way people view and create films. It's a healthy process, she said. "The history of the motion picture is a history of constantly shifting venues; and here's what happens: Film never dies, it keeps going," she said. But she still sees the movie theater experience as the cheapest and fullest way to abandon your troubles and lose yourself in a story. "Movies are a great form of escape because you enter a darkened place and surrender to something that's bigger than you," she said. Warner Bros., maker of "Friday the 13th," is owned by Time Warner, which is the parent company of CNN.